Four double cabins with ensuites. 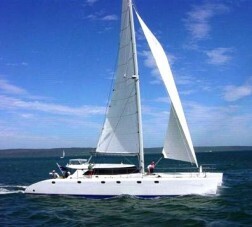 The Executive 73 is a Lidgard designed 73 foot sailing catamaran. She is constructed from epoxy-stitched glass-foam cored composites for both shells and internals. She also offers exquisite marble and teak wood in her interior and hand crafted workmanship has been utilised throughout as well as fittings of the highest quality. She provides luxurious accommodation for up to 8 charter guests in 4 cabins.The Executive 73 is available for luxury sailing charters in the Mediterranean.